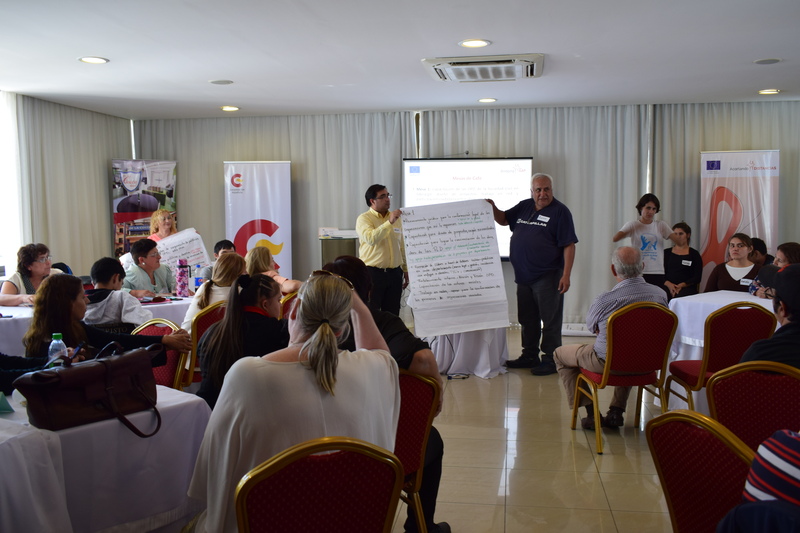 On October 26 and 27, the Paraguayan city of Encarnación hosted the First National Meeting of the project Bridging the Gap, during which actions identified as priority by member organizations of the National Commission for the Rights of Persons with disabilities (CONADIS) for the 2019-2020 Work Plan of the project were validated. This meeting was held within the framework of the 10th Meeting of Organizations of Persons with Disabilities. The meeting was opened by the Minister of the National Secretariat for the Human Rights of Persons with Disabilities (SENADIS), César Martínez; the Governor of Itapúa, Juan Alberto Schmalko; the President of the Judicial District of Itapúa, Elsa Isabel Kettermann; and the President of the Departmental Board, Silvio Piris. All of them stressed the relevance and commitment to articulate actions and promote the participation of people with disabilities in the decisions that affect them, as well as in the analysis of specific problems related to the guarantee of rights and access to services and justice. The opening remarks also included the words of the Program Manager of the Spanish Agency for International Development Cooperation (AECID) in Paraguay and Bridging the Gap coordinator in the country, Carmen de Diego; the President of the host organization of the event, the San Rafael Center for Attention to Persons with Disabilities (CAPROVI), María Celia Díaz; and Mario Marecos on behalf of CONADIS. After the institutional opening, the minister of SENADIS, together with the senators Enrique Riera and Juan Afara; the President of the Municipal Board, César Rojas; and the advisor of the Permanent Commission on the Rights of Persons with Disabilities of the Chamber of Deputies, Laura Velázquez, participated in a debate on the reality of persons with disabilities in the Department of Itapúa. The minister of SENADIS highlighted the diversity of actors involved in this meeting as a “positive sign towards the goal of building an increasingly inclusive society”. The event brought together 72 people representing organizations of persons with disabilities from 15 departments of the country, who for two days discussed the National Action Plan for the Rights of Persons with Disabilities 2015-2030, which was recognized as a “roadmap” for making decisions regarding legislation and the budget for the rights of persons with disabilities. Participants also validated the 2019-2020 Work Plan of Bridging the Gap project, which is contributing to the National Action Plan by constructing indicators and measurable goals that allow for the measurement of progress and the permanent monitoring process and evaluation of State plans and programs. These indicators will provide information on the progress and challenges of the State to respect, protect and make effective the rights of persons with disabilities, so that appropriate adjustments can be made to ensure its compliance. The Meeting also had a space for reflection on women and disability, and several workshops and discussions in which the scope of the Action Plan of Bridging the Gap was analysed, and lines of action for the strengthening of the OPD and the improvement of their national and international articulation were defined. In addition, recommendations for the implementation of inclusive education, as well as for the strengthening of political participation and the development of departmental and regional networks were set.